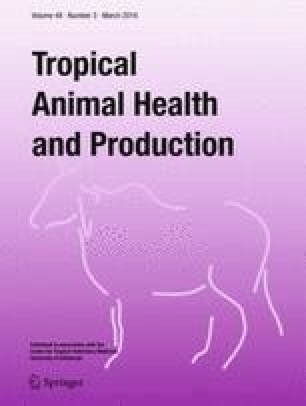 African animal trypanosomosis is a great obstacle to livestock production where tsetse flies play a major role. Metekel zone is among the tsetse-infested areas. Community-based tsetse fly and trypanosomosis control using targets was conducted from June 2011 to May 2012 in Metekel zone, Ethiopia, to decrease trypanosomosis and tsetse fly. Cloth screen targets were developed, impregnated with 0.1 % deltamethrin, and deployed alongside rivers by the research team together with the community animal health workers. Monthly parasitological and entomological data were collected, processed, and compared with similar data collected before control. Overall average tsetse fly (Glossina tachinoides) density decreased from 1.13 to 0.18 fly/trap/day after control. The density was decreased in all sites with no significant difference among the sites. However, higher decrements were observed in the dry and late dry seasons by more than 12 and 6 times, respectively. The reduction in overall apparent prevalence of trypanosomosis caused by Trypanosoma congolense, Trypanosoma brucei, and Trypanosoma vivax from 12.14 % before to 3.61 % after control coincides with the tsetse fly reduction. In all the study sites, significant reduction was observed before and after control. The highest decrement was observed in the late dry season when the apparent prevalence was reduced from 7.89 to 1.17 % before and after control, respectively. As this approach is simple, cost-effective, and appropriate for riverine tsetse species, we recommend to be scaled up to other similar places. Authors of this paper would like to thank Ethiopian Institute of Agricultural Research for financing this project. Pawe Agricultural Research Center in general and Animal Research Process in particular are highly acknowledged for their cooperative field works. Canadian Physicians for Aid and Relief (CPAR), Dibate, Ethiopia, are highly acknowledged for their financial and transport support. The authors declare that all component of the study were conducted in line with the current law of the country. The authors declare that there is no conflict of interest among them. OIE. 2013. Trypanosomosis (tsetse-transmitted). Terrestrial Manual. http://www.oie.int/fileadmin/Home/eng/Health_st&ards/tahm/2.04.18_TRYPANOSOMOSIS.pdf.